I don’t know about you, but the ninety-degree days around here do not inspire me to rev up the oven! 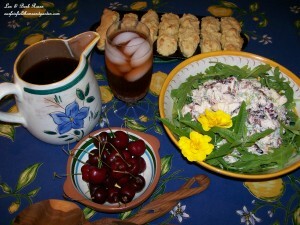 This is a simple, quick make ahead supper that we ate on hot nights when I was growing up in an unairconditioned home. You can make this up in the morning when it is cooler and refrigerate it to serve in the evening. Make extra. Everyone always wants seconds on this meal and you’ll have some for lunch the next day too! Now, understand this is a family recipe and I have no idea what the origin is or why “Waldorf” is the name, just that it is an oldie but a goodie! The ingredient amounts are approximate, so experiment and make it your own! Chicken Waldorf Salad goes nicely with fresh cornbread (get the gluten-free mix from the store if you are like me!). If you are feeling wild and adventurous, throw in some tarragon from the garden and eat this delightful salad open face on a slice of buttered cornbread. Enjoy!